In sports, everyone is a winner—some people just win better than others. 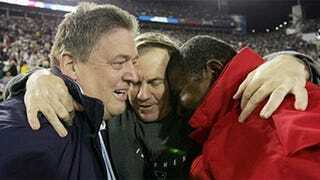 Like Patriots fans who love everything about New England's recent dynasty, except Bill Belichick and Tom Brady. Pack your bags, you're moving to K.C.! The Chiefs have just hired deposed Notre Dame coach Charlie Weis to be their new offensive coordinator, which may not be a completely terrible move. He may have been totally overmatched as a college head coach, but his pro offensive looked pretty snappy during the three Super Bowls he helped win earlier this decade. Weis was of course hired by his former boss in New England, Scott Pioli, whose first decision after he was hired to run the Chiefs was to snap up another New England castoff, QB Matt Cassel. (He never played for Weis, but I'm sure some of that prodigious aura rubbed off.) And now, almost immediately after the Weis' decision comes rumors that Pioli is looking to bring in the Patriots' former defensive coordinator Romeo Crennel, which will make Kansas City almost exactly like New England ten years ago, so you should all just go back to bed. If you overlook the fact that Bill Belichick's former assistants are an almost universal failure anywhere outside of Massachusetts then these moves look pretty sweet. All they need now is for Charles Woodson to make someone fumble in the snow and we've got ourselves a Midwest football power. Honorable Mention: The Chippewas of Central Michigan. Someone check America's temperature, because I think it's contracted LeFevour!